This book was recommended and loaned to me by a friend. I am always prepared to try a new author and stuck to my word. 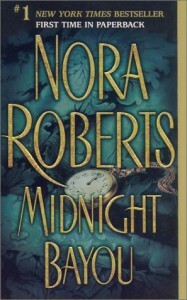 I had always heard about Nora Roberts but hadn't considered reading her books until now. The book features 2 love stories - one set in 1899 & one in 2002, both in New Orleans, Louisiana. The first love story is between Lucian Manet (A rich heir) and Abigail Rouse (A cajun servant of the house). Lucian marries Abigail and in doing so, disgraces the family. When the tragedy occurs, time stands still for both Lucian and Abigail. The second love story is between Declan (a lawyer from Boston) and Lena (a local from the bayou). Their story unfolds as the story progresses. After Declan calls off his previous engagement, he hears that Manet Hall is for sale. He leaves his life in Boston and moves to New Orleans. Local legend has it that the house is haunted, and Declan starts seeing terrible visions from long ago. Since he first saw the dilapidated Manet hall, he knew he wanted it and would restore it to the beautiful place it used to be. He is completely enchanted and has a draw to Manet Hall he is yet to understand. When he meets Lena, he is glad of the distraction, as he has been working night and day to bring the Hall back to life, and is infatuated with her from the moment he lays eyes on her. As the story unfolds you realize that Lena has her own surprising connection to the Hall. Together they uncover a secret that's been buried for hundreds of years. I truly did not expect to enjoy this book as much as I did. It was refreshing to read about an adult romance for a change. The story starts off with a sad tone, with strong emotions that capture your interest and attention. It has you constantly wishing for a happy ending and a need to keep on reading. I enjoyed the role reversal of Lena playing hard to get in their courtship. That she was testing him and seeing how far he would go for her, and how long he would stick around. The other characters also had me giggling from time to time. The Main Characters Declan - A man's man - strong, handsome and charming with a good sense of humor and a good heart. Lena - A strong woman who stands her ground. Remy - The typical best friend - I think Nora really captured the essence of a true and long friendship. Effie (Remy's Fiancé) - I loved Declan's teasing and interaction with her. Grandma Odette - Lena's sweet old Grandmama, a typical grandma that bakes bread, and loves with a full heart. Nora's writing takes you to a whole different world. Her style of writing makes you feel apart of the story.